Phillip Island is one of Victoria’s most popular tourist destinations. 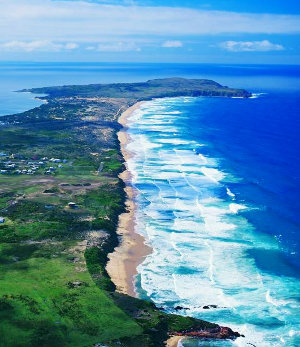 It is well-known for its famous penguin parade, large fur seal colony, native wildlife, exciting racing at the island’s Grand Prix circuit, its scenic coastline, quaint fishing villages, beautiful beaches, outdoor dining, and so much more. The island’s reasonably close proximity to Melbourne makes it a popular choice for visitors, be it a day trip or longer stay. As the crow flies, Phillip Island is only 75 kilometres from Melbourne. There are a number of ways to get there. Phillip Island is linked to the Victorian mainland by a bridge at San Remo. 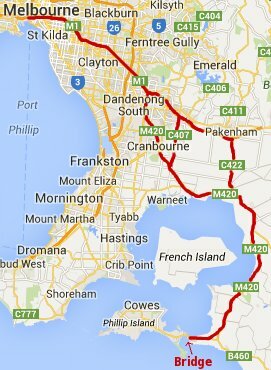 The distance to drive from the heart of Melbourne to the bridge is just over 120 kilometres. Head south-east along the Monash Freeway (M1), taking either the South Gippsland Freeway (M420), Clyde Road (C407) or Koo Wee Rup Road (C422) exit. Follow the M420 and B420 signs as you travel along the South Gippsland Highway, Bass Highway and Phillip Island Road. The journey time is usually around 90 minutes. Note that there is no car ferry to Phillip Island, so if you wish to bring your vehicle onto the island, you must use the bridge at San Remo. A number of V/Line bus services run between Southern Cross Station in Melbourne and several towns on Phillip Island including Newhaven, Cape Woolamai, Surf Beach, Sunderland Bay and Cowes. The journey from Melbourne requires a change of bus at Koo Wee Rup and takes around 2 hours to get to the bridge and a further 20 to 25 minutes to Cowes. Another option is to catch a suburban train service to Dandenong. From there, catch a V/Line bus that travels direct to Phillip Island. The train journey to Dandenong takes between 40 to 50 minutes, depending from which station in Melbourne’s city centre is used. The bus journey from Dandenong to the Phillip Island bridge takes around one hour and 45 minutes, and a further 20 to 25 minutes to Cowes. Refer to timetable for Melbourne to Cowes which also includes details of the train service to Dandenong. For something a little different, you can catch a suburban train from Melbourne to Frankston (1 hour), then switch onto a diesel service which runs from Frankston to Stony Point (35 minutes). From Stony Point Jetty, board the Inter Island Ferries passenger catamaran which docks at the Cowes Jetty. The boat trip takes around 45 minutes, usually with a stop at French Island. 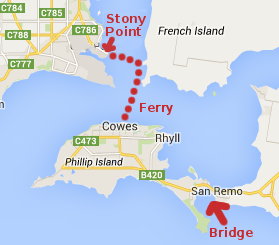 If you have a vehicle but don’t want to drive all the way around the eastern side of Western Port to the Phillip Island bridge at San Remo, you can instead drive to Stony Point and catch a passenger ferry from there. Head south-east along the Monash Freeway (M1), take the South Gippsland Freeway (M420) exit and continue along that road which becomes the Western Port Highway (M780/A780) and ends up at Hastings. Alternatively, take the EastLink (M3) exit off the Monash Freeway, then the Peninsula Link (M11) exit and follow that freeway to the Frankston-Flinders Road (C777) exit which takes you to Hastings. 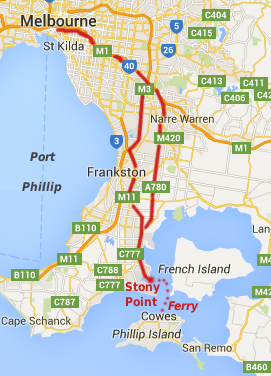 Once in Hastings, follow the Frankston-Flinders Road (C777) to Bittern where there is a turn-off to Stony Point Road (C786) which ends up at the Stony Point railway station and jetty. There is a public car park in the vicinity of the railway station and jetty. Alternatively, secure parking is available for a nominal daily fee at the Stony Point Caravan Park. Did you know that Phillip Island has its own airfield? So you can get to the island by air! Fronting Phillip Island Road at Newhaven are Phillip Island Helicopters who not only conduct scenic flights, but also offer charter services. In just 30 minutes, you can be flown from suitable landing locations in Melbourne, such as Essendon Airport or Moorabbin Airport, directly to Phillip Island. Avoid the traffic and save time! 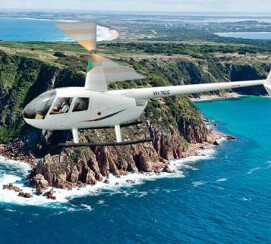 See www.phillipislandhelicopters.com.au for further details. Take the hassle out of getting to Phillip Island and finding your way around by joining one of the many guided day tours that departs from Melbourne. Day tours include a range of activities such as a visit to the famous Penguin Parade and eco-tours that explore the island’s diverse flora and fauna. Tours may also include visits to Churchill Island, the Koala Conservation Centre, The Nobbies and the island’s beautiful coastline and beaches. If you are coming to Melbourne by air, see our guide to transport between Melbourne Airport and the city centre. Once in Melbourne’s city centre, choose from the above options to get to Phillip Island. I want to travel from Tullamarine to Cowes on Sat 29/10/16 pm or early Sunday 30/10/16 for the Victorian State Championship racing at Philip Island So how do I do it easily and as a non-local visitor. Or I will just not visit Victoria and save my money !! One thing not mentioned here is how you get around Phillip Island once you arrive by bus or ferry from Melbourne. There are minimal (but some) options available which can be viewed under the ‘transport’ section of the visitphillipisland webpage, or you can ask the local Visitor Info Centre once you’re there. It’s also worth noting there is no bus back to Melbourne after the penguins, so I stayed the night and spent the morning on the beach before heading back. In fact I was surprised how much there is to see so happy i stayed overnight. This year’s Grand Prix is on from 26th to 28th October 2018. Next year, the provisional date (subject to change) is from 25th to 27th October 2019. What is the best way to get from Phillip iIs to St Kilda for a day trip? If you would like to do the entire journey by bus, you’ll need to first go to Southern Cross Station in Melbourne. Simply catch tram number 12 or 96 from St Kilda to Southern Cross Station, which will take about 20 minutes. Then follow the instructions above for travel by bus to Phillip Island. If you are using the train and bus option that is listed above, you first need to catch a tram to any station on the Dandenong line. Tram 3 to Caulfield or 16 to Malvern are recommended. Then follow the instructions above for the train and bus option. Heading to the Aus Open this weekend and hkping to spend a day at Phillip Island. What is the easiest transport option to do a day trip to Phillip Island? If you have a have access to a car in Melbourne, the quickest way to spend a day to Phillip Island is to drive there. You then have your own transport to explore the island. Alternatively, there is public transport to Phillip Island – see our posting above for the various options. Some people prefer the ease and comfort of joining a guided tour of Phillip Island. Check out Penguin Island Tour at https://www.penguinislandtour.com.au/ – they are one of many tour operators that pick-up people from Melbourne and take them to Phillip Island for the day.